Does your church encourage and support cell or small group ministries? WorkingChurch makes organizing them a snap. Our software allows you to create an unlimited number of groups, or categories, for organizing your church membership and other contacts. Other church software programs for member management may require you to live with their predefined groups and categories, for members,cell orsmall groups, etc. But, with Working Church you are free to create groups such as: Members, Visitors, Cell Groups, Small Groups, Elders, Deacons, Board Members, Men of the Church, Women of the Church, Youth, Suppliers, Vendors ... the list is endless. Your groups are unique to your ministry. Place each of your members into as many different groups as they belong, along with dates of membership and other pertinent information. Then, send emails or print mailing labels for the entire group. Send schedules of meeting times and places, prayer concerns or general information as often as you like. We guarantee you will save time and energy by avoiding the confusing task of removing a contact from one database and inserting them into another. Once you've tried Working Church software for yourgroup and member management needs, we think you will soon agree that our concept of group memberships, with the power and flexibility it puts in your hands, sets a new standard for member management software, and beats any other church attendance, church management software, or membership software products hands down, especially at our affordable price (click here to see). 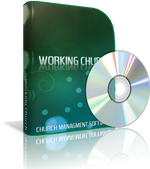 A free, fully-functional demo of Working Church software is available for download. Click the image, or link, below for instant access. Unlimited number of lists, such as prayer, "To Do", visitations, etc. Track purchase price, date purchased, current value, etc.